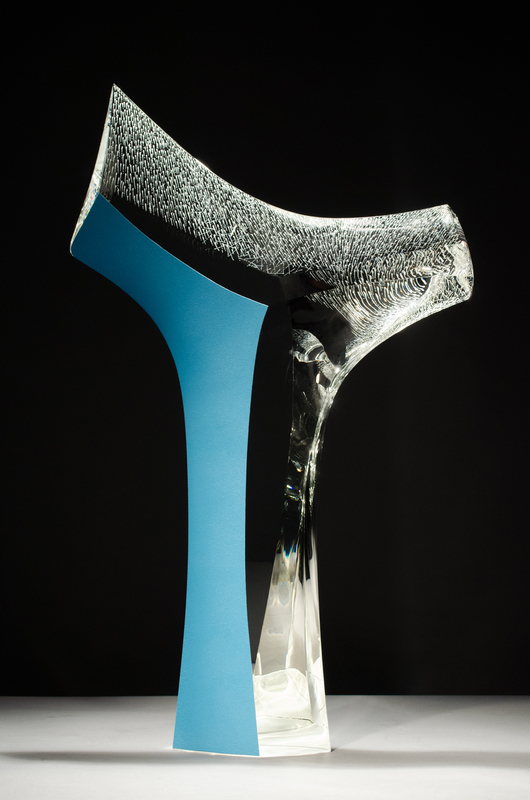 Sally Fawkes and Richard Jackson are artists with established solo careers sculpting predominantly in glass. Passion and joy for integrating their ideas with material mastery lead them to establish their large studio in the Cotswold town of Stroud. Committed to continuously developing their work, they have built up facilities over the last 19 years which enables them to work on varying scales and different types of projects. They create self-directed work for exhibition, and work to commissions for private, corporate and public spaces. They have also both completed prestigious residencies, researching and exploring new mediums and approaches which have challenged their creative positions and driven their practice forward. Their sculpture ranges from domestic to the large scale for interior, exterior and marine locations. Sharing their studio together, and knowing each others work intimately, gradually lead to their collaborating. Over the last decade their collaborative sculpture has emerged to become a significant part of each artists practice and is now presented under the name of Jackson Fawkes. Both artists have won awards for their artwork, have international exhibition profiles and are represented in many museum and public collections in both their solo and collaborative capacities.